Students also have the option to buy their own graver and scriber: approx. £10.00 each • Cost of copper plates approx. £8.00 • Students may also bring their own silver or copper to engrave on if they wish. 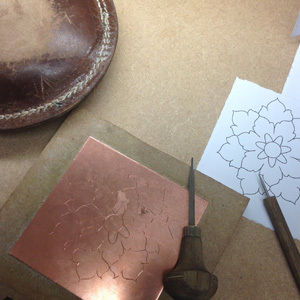 Ruth Anthony is a hand engraver based in the jewellery quarter of London’s Hatton Garden. She works in the jewellery trade undertaking all kinds of engraving on metal, jewellery and silverware ranging from lettering inscriptions to heraldic and decorative work. Ruth studied jewellery design and manufacture. After finishing college she moved to the UK from South Africa and worked as a goldsmith at the bench making and repairing jewellery for Lawson’s Goldsmiths in the Oxfordshire countryside. Wanting to add a few more strings to her bow, she took evening classes in hand engraving and enjoyed it so much she decided to re-train as an engraver and applied for a trainee apprenticeship in London where she learned traditional jewellery engraving. A maximum of nine places are available on this course, with a minimum of six participants required for the course to run. Full payment is required to secure a place. We can take card payments over the phone – please note the cost of the day is not refundable. Once payment is received we will send an email confirming your place on the course.